(NC) From basketball practice to music lessons, the after-school rush can be a hectic one. For evenings when you’re pressed for time, meal prep can be a lifesaver. 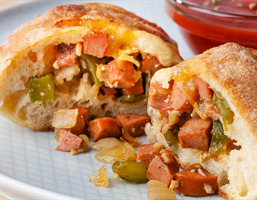 Stuffed with a favourite ingredient – hot dogs – these Tex-Mex calzones are a tasty meal the kids will happily enjoy. With new Maple Leaf Top Dogs, you can feel confident your little ones’ favourite food is made from real ingredients found in your own kitchen. Enjoy these calzones straight away, or make them ahead of time, wrap individually in plastic wrap and keep them stored in the freezer. When you’re ready to enjoy, reheat in the oven and serve warm. Preheat oven to 425°F (220 °C). Prepare two sheet pans with parchment paper and dust with all-purpose flour. On a clean, floured work surface, cut pizza dough into 8 equal pieces. Using a floured rolling pin, roll dough pieces into 1/4-inch-thick circles. Place on baking sheets and set aside while making your filling. Add chopped hot dogs, onion, bell pepper, garlic, cumin, chili powder, salt and pepper into a large bowl. Combine by mixing with a spoon. Heat a large skillet with olive oil to medium-high heat. Add hot dog mixture and sauté until vegetables are softened; about 4 minutes. If there is excess water, drain mixture using a sieve. Add 1/4 cup (60 mL) of hot dog filling to the centre of each dough round. Top mixture with a tablespoon of cheese. Brush edge of half the dough round with egg wash; this will help the calzone stick together. Fold dough over filling and use a fork to close and secure the filling into the calzone. Add more shredded cheese to the top of the calzone and then using a knife, cut a few steam vents into the top of each to prevent them from bursting or getting soggy. Bake until golden brown; about 15 to 20 minutes. Let cool slightly and then serve.